Bayit Yehudi keeps veto on law to increase number of voters, particularly women, in body that elects Rabbinate. 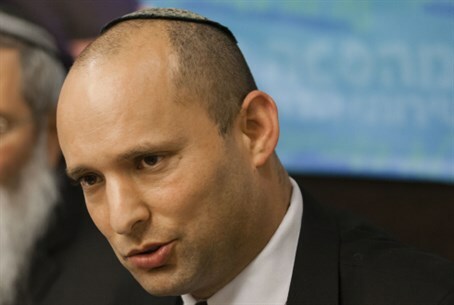 The Bayit Yehudi (Jewish Home) party will continue to veto the Stern Law, which would increase the number of people, particularly women, on the board that elects Israel’s Chief Rabbis, party head Economics Minister Naftali Bennett said Tuesday. Bennett argued that his party’s opposition to the law would not mean fewer women on the board. Deputy Minister Rabbi Eli Ben-Dahan (Bayit Yehudi) will make sure to appoint women to the board, he explained, as the Religious Affairs Ministry appoints ten of the members. Bayit Yehudi previously expressed support for the law. Sources in the party said party leaders had changed their minds after realizing that MK Elazar Stern (Hatnua) was planning to make “inappropriate” use of it to promote agendas with which the party does not agree, by diluting the influence of rabbis on the board. The current ratio is 80 rabbis to 70 lay people. “The law is essentially good, and it has potential, but the current use to which it is being put is not reasonable. So Naftali decided not to remove the veto,” they explained. The law is seen as promoting the appointment of Rabbi David Stav as the next Chief Ashkenazi Rabbi, and the appointment of religiously liberal rabbis in general. Rabbi Chaim Druckman has expressed opposition to the Stern law, and has rejected claims that the current system means the body that chooses chief rabbis is controlled by hareidi factions.